Marquis, 2000). Thus experimentally 'grazed' plants of Oenothera macrocarpa produced 30% fewer flowers and 33% fewer seeds. Plants may also be affected more directly, by the removal or destruction of flowers, flower buds or seeds. Thus, caterpillars of the large blue butterfly Maculinea rebeli feed only in the flowers and on the fruits of the rare plant Gentiana cruciata, and the number of seeds per fruit (70 compared to 120) is reduced where this specialist herbivore occurs (Kery et al., 2001). Many studies, involving the artificial exclusion or removal of seed predators, have shown a strong influence of predispersal seed predation on recruitment and the density of attacked species. For example, seed predation was a significant factor in the pattern of increasing abundance of the shrub Haplopappus squarrosus along an elevational gradient from the Californian coast, where predispersal seed predation was higher, to the mountains (Louda, 1982); and restriction of the crucifer Cardamine cordifolia to shaded situations in the Rocky Mountains was largely due to much higher levels of predispersal seed predation in unshaded locations (Louda & Rodman, 1996). It is important to realize, however, that many cases of 'herbivory' of reproductive tissues are actually mutualistic, benefitting both the herbivore and the plant (see Chapter 13). Animals that 'consume' pollen and nectar usually transfer pollen inadvertently from plant to plant in the process; and there are many fruit-eating animals that also confer a net benefit on both the parent herbivores affect plant growth ... ... indirectly by reducing seed production . . .
... and directly by removing reproductive structures much pollen and fruit herbivory benefits the plant plant and the individual seed within the fruit. Most vertebrate fruit-eaters, in particular, either eat the fruit but discard the seed, or eat the fruit but expel the seed in the feces. This disperses the seed, rarely harms it and frequently enhances its ability to germinate. Insects that attack fruit or developing fruit, on the other hand, are very unlikely to have a beneficial effect on the plant. They do nothing to enhance dispersal, and they may even make the fruit less palatable to vertebrates. However, some large animals that normally kill seeds can also play a part in dispersing them, and they may therefore have at least a partially beneficial effect. There are some 'scatter-hoarding' species, like certain squirrels, that take nuts and bury them at scattered locations; and there are other 'seed-caching' species, like some mice and voles, that collect scattered seeds into a number of hidden caches. In both cases, although many seeds are eaten, the seeds are dispersed, they are hidden from other seed predators and a number are never relocated by the hoarder or cacher (Crawley, 1983). Herbivores also influence fecundity in a number of other ways. One of the most common responses to herbivore attack is a delay in flowering. For instance, in longer lived semelparous species, herbivory frequently delays flowering for 1 year or more, and this typically increases the longevity of such plants since death almost invariably follows their single burst of reproduction (see Chapter 4). Poa annua on a lawn can be made almost immortal by mowing it at weekly intervals, whereas in natural habitats, where it is allowed to flower, it is commonly an annual - as its name implies. Generally, the timing of defoliation is critical in determining the effect on plant fecundity. If leaves are removed before inflorescences are formed, then the extent to which fecundity is depressed clearly depends on the extent to which the plant is able to compensate. Early defoliation of a plant with sequential leaf production may have a negligible effect on fecundity; but where defoliation takes place later, or where leaf production is synchronous, flowering may be reduced or even inhibited completely. If leaves are removed after the inflorescence has been formed, the effect is usually to increase seed abortion or to reduce the size of individual seeds. 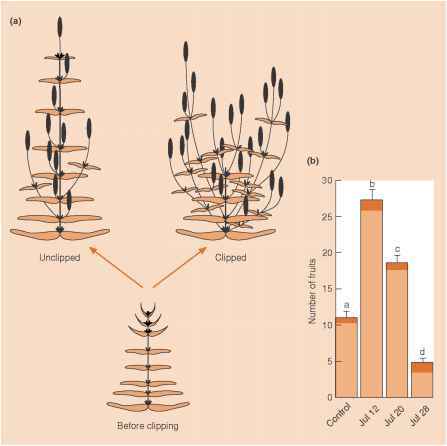 Figure 9.6 (a) Clipping of field gentians to simulate herbivory causes changes in the architecture and numbers of flowers produced. (b) Production of mature (open histograms) and immature fruits (black histograms) of unclipped control plants and plants clipped on different occasions from July 12 to 28, 1992. Means and standard errors are shown and all means are significantly different from each other (P < 0.05). Plants clipped on July 12 and 20 developed significantly more fruits than unclipped controls. Plants clipped on July 28 developed significantly fewer fruits than controls. (After Lennartsson et al., 1998). occurred between 1 and 20 July, but if clipping occurred later than this, fruit production was less in the clipped plants than in the undipped controls. 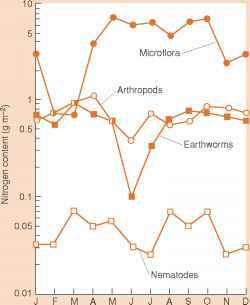 The period when the plants show compensation coincides with the time when damage by herbivores normally occurs. How herbivory can affect fecundity of plants?